In March, MAS Announces of a custom bond that aims to help Singaporeans save money at a higher savings return. This afternoon, they release more information on how to purchase it, how much you can purchase each time, and the max limit which you can hold. All this point to my point that while, it is not as liquid as cash savings account, but it is still very liquid, enough for me to allocate my emergency fund to it. 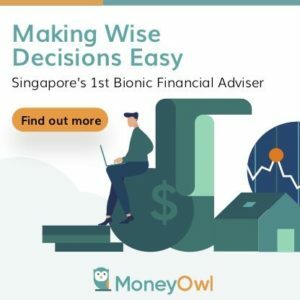 Investors will be able to apply for each Savings Bonds issue with amounts ranging from S$500 to S$50,000, and they can hold up to S$200,000 of Savings Bonds at any point in time. The Government will review the caps if there is a need for it, after the programme is implemented, said Mrs Teo. Wow. More than the $50,000 I anticipated. If the maximum amount that you can apply to is $50,000, it means you need 2 month to fulfil the limit. It would seem that how to purchase this SSB is like how to purchase newly auction Singapore Government Bonds and Treasury Bills. It is just that not many would know about it. I see that the agency will published the details of the SSB issue for, lets say, next month. You will now know the various half yearly coupon, what is the various duration’s yield to maturity. You can then decide to buy or not. A bank account with DBS, POSB, OCBC or UOB. This should be easy. Note that your half yearly coupon will be deposited to the CDP linked bank account. A Central Depository Securities Account (CDP account) to hold your bonds. This is the account you normally need to hold your Singapore Stocks. This account can usually be open with your brokerages when you apply to them. Examples of brokerages are Philips POEMS, Lim and Tan, Kim Eng, iOCBC, UOB Kay Hian, DBS Vickers. You can also go to SGX offices to open the CDP account without going through the stock brokerages. I anticipate their offices to be flooded haha. CDP should send you a letter stating the number of units and amount purchase. There might be a slight change to this work flow but it should be something like this. Fundsupermart, Singapore’s premier unit trust house, allows investors to purchase SGS Bonds issued from their platform. SGS Bonds is the underlying bonds within the Singapore Savings Bonds. 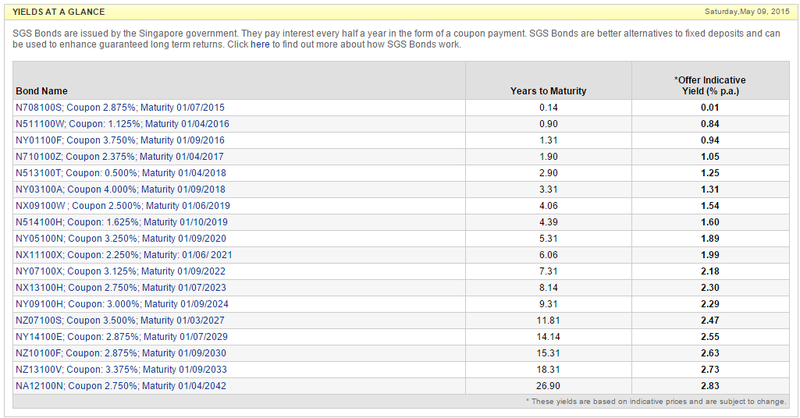 The years to maturity shows how many years this bond will mature, or that the bond issuer (in this case the Singapore Government) will return you your principal amount. The yield shows you that if you purchase this bond from open market, the yield per annum you will receive. So NY09100H have 9.31 years to maturity and if you buy this bond today, you will earn 2.29% per annum if you do not sell it. 9.31 years is close enough to 10 years, and gives us the likely indication that if you buy a new SSB bond and don’t sell it for 10 years, the yield may be closer to 2.3%. If you sell it after 6 years, for the 6 years you own it your rate of return per annum is 1.99%. I think many will still prefer their OCBC 360 account or UOB ONE account, since they provide more attractive rates. However, if you have more cash lying around this would be a consideration. I find that this appeals to the people who likes principal protection. I am interested to see whether this will improve Singaporean’s idea of bonds, which is an asset classes usually not talked about in this part of the world. Do you think this is good enough for you? Do you know how the withdrawal of SSB works – has news on this been released? Say, if I buy $50,000 in a month, and 2 years later, I’d like to withdraw partial of $20,000, guess this is allowed. will wait for more details. not much information have been release about that part but I am interested as well.